Vial Filling Machine is uses for the filling and stoppering glass vials. Machine able to fill liquid and powder injection into glass vials with moderate production speed. We are having different machine models in this machine which are suitable as per different customer requirements. These machines are uses in pharmaceutical industry for filling liquid and powder injectable dosages. Injection Vial Filling Machine is suitable for the liquid filling and rubber stoppering injectable vials. Machine complete in pleasing matt finished stainless steel. The basic unit consists of turntable, S.S. Stat conveyor belt, unique eccentric pre-gassing, filling and post-gassing. Highly efficient and precision built S.S. 316 Syringes, non- toxic synthetic rubber tubing and easy reach compact panel. 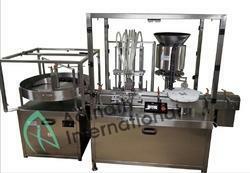 Glass Vial Filling Machine is suitable for the liquid filling and rubber stoppering injectable vials. Machine complete in pleasing matt finished stainless steel. The basic unit consists of turntable, S.S. Stat conveyor belt, unique eccentric pre-gassing, filling and post-gassing. Highly efficient and precision built S.S. 316 Syringes, non- toxic synthetic rubber tubing and easy reach compact panel. 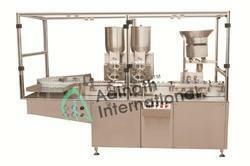 cGMP Vial Filling Machine is suitable for the liquid filling and rubber stoppering injectable vials. Machine complete in pleasing matt finished stainless steel. The basic unit consists of turntable, S.S. Stat conveyor belt, unique eccentric pre-gassing, filling and post-gassing. Highly efficient and precision built S.S. 316 Syringes, non- toxic synthetic rubber tubing and easy reach compact panel. 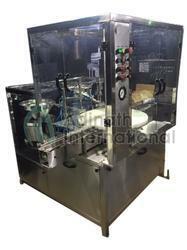 Automatic Vial Filling and Capping Machine is suitable to fill injectable glass vials. The basic unit consists of turntable, Stainless Steel Stat conveyor belt, unique eccentric pre-gassing, filling and post-gassing. Highly efficient and precision built Stainless Steel 316L Syringes, non- toxic synthetic rubber tubing and easy reach compact panel. The incoming dry vials (sterilized and siliconized) are fed through the unscrambler and suitably guided on the moving delrin slat conveyor belt at the required speed of the correct placement below filling unit. Automatic Vial Filling and Plugging Machine is suitable to fill injectable glass vials. The basic unit consists of turntable, Stainless Steel Stat conveyor belt, unique eccentric pre-gassing, filling and post-gassing. Highly efficient and precision built Stainless Steel 316L Syringes, non- toxic synthetic rubber tubing and easy reach compact panel. Automatic Vial Filler is suitable to fill injectable glass vials. The basic unit consists of turntable, Stainless Steel Stat conveyor belt, unique eccentric pre-gassing, filling and post-gassing. Highly efficient and precision built Stainless Steel 316L Syringes, non- toxic synthetic rubber tubing and easy reach compact panel. We offer premium quality Automatic Eye Drop Filling Machine to our esteemed customers. Manufactured as per the industry set norms and regulations, these machines are extremely appreciated for their automated operations, low power consumption and optimum performance. 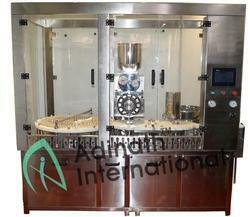 These machines are used for the purpose of filling plastic vials in the pharmaceutical industry.